The government as set forth in the City Charter is a “commission-manager” government. 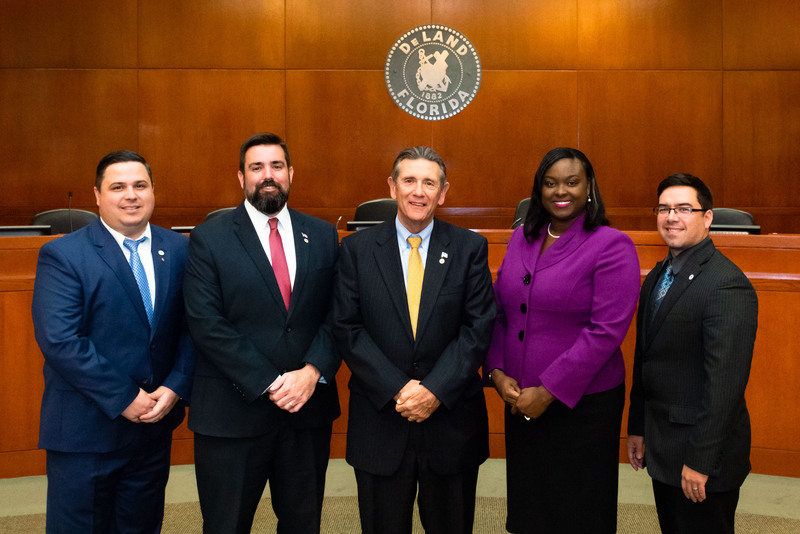 The City Commission is comprised of five Commissioners, one of who is elected as the Mayor-Commissioner, all are elected from the City at large. The Mayor-Commissioner presides over meetings of the Commission and serves as the ceremonial head of the government. The City Commission determines policy in the areas of economic development, planning, traffic, law and order, fire prevention and suppression, public works, parks, recreation, finance, utilities, and airport operations. The City Commission appoints and removes the City Manager, City Attorney and City Clerk. The City Commission adopts a budget, levies taxes, collects revenues and makes appropriations and authorizes the issuance of bonds. The City Commission determines policy by adopting ordinances and resolutions, appropriating moneys, and exercising other essential legislative duties. City Commission meetings are held on the 1st and 3rd Monday of the month at 7 pm in the Commission Chambers. Live Streaming is available only during the meetings. Agendas are available for viewing the Friday before the meeting. Robert F. “Bob” Apgar has been a resident of DeLand since 1959. He has served his community as an elected official for over 29 years. He is a shining example of leadership, citizen involvement, community spirit, and civic responsibility. Bob Apgar’s service as a City Commissioner began in May of 1983 when he served two 4-year terms. He was elected again as City Commissioner in October of 1996 and served until June of 2001 when he resigned his position to run for Mayor. He was elected as Mayor in October of 2001 and then reelected in 2005 and 2010 without opposition. In 2014, he was reelected to his fourth term as Mayor. 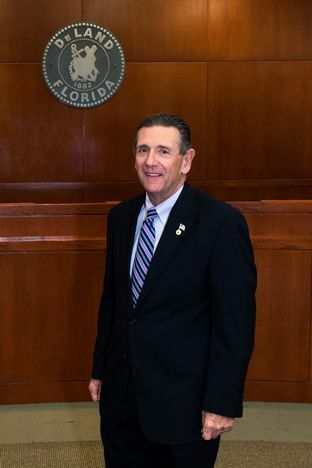 During Bob Apgar’s tenure as Mayor, the City of DeLand has endured the most difficult issues a growing city can face, including numerous complex land development issues, a changing workforce, changes in the makeup of the community, and balancing a city budget with diminishing revenue while trying to limit any loss of city services. Those who have worked with the Mayor in dealing with these difficult issues would describe him as a man of integrity, as his actions are always honest and straightforward. He adheres to the highest ethical standards. For these reasons, he has strong creditability with citizens and other elected officials in Volusia County and the state. In August of 2009, the Florida League of Cities awarded him its highest award, the E. Harris Drew Lifetime Achievement Award. Bob Apgar is a 1965 graduate of DeLand High School. He earned a Bachelor of Arts in psychology from Davidson College, Davidson, North Carolina in 1969. He earned his law degree at the University Of Florida College Of Law in 1971. Bob Apgar has been a resident of DeLand for over 50 years. He is married to Teresa Apgar and they have three children and seven grandchildren. In his spare time he enjoys reading, traveling, watching sports and just being a grandparent. 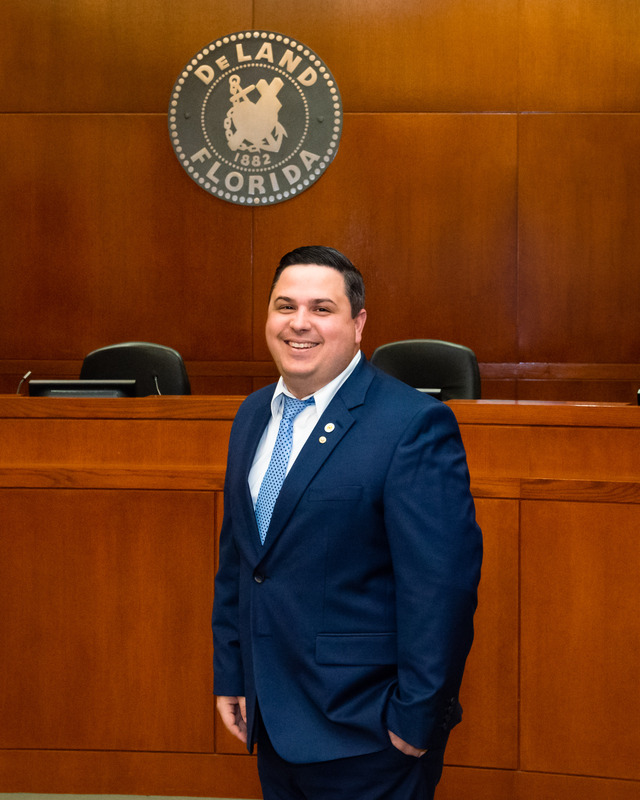 Charles Paiva was appointed to the City Commission in August 2018. Paiva previously served on the City Commission from 2001 to 2005 and 2006 to 2016. He was born and raised in DeLand. He is currently a Physical Therapist Assistant/Clinic Manager at Florida Hospital DeLand Sports Medicine and Rehabilitation. 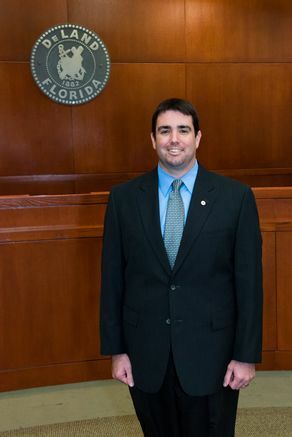 Chris Cloudman was appointed to Seat 4 of the City Commission in September of 2014. Chris was born in Boyton Beach, Florida and grew up in Port Orange. He moved to DeLand in 2008 from Oracle (Tucson), Arizona. Chris Cloudman is married to Megan Cloudman and they have two daughters, Emily and Isobel. He enjoys attending community events with his family, exploring our city roadways and trails on bicycle and volunteering at local charity / fundraising events. Jessica Davis was elected to Seat 3 on the DeLand City Commission on August 26, 2014, making her the first African American female to be elected to The DeLand City Commission. 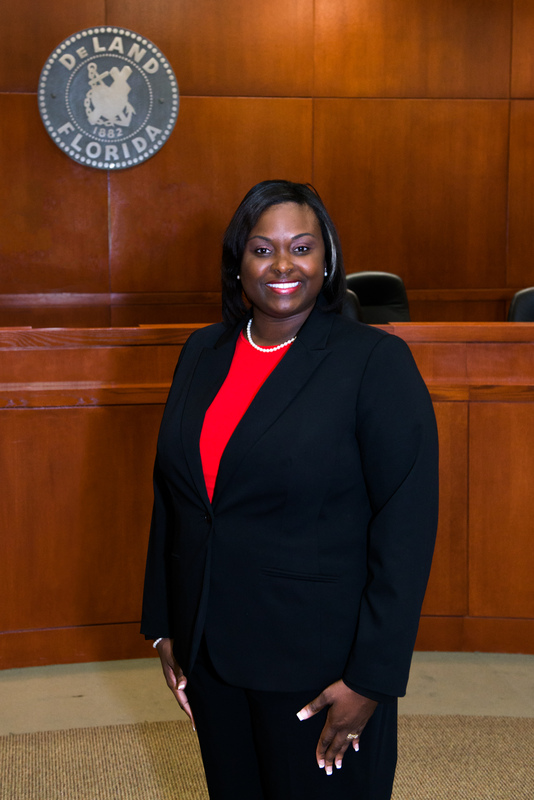 Jessica Davis understands the sense of urgency needed in serving the citizens of DeLand and has a vested interest in the community. Understanding how economic development is directly related to communities and schools is vital to short and long-term success. Jessica understands such interrelationships and will ensure to the best of her ability that the citizens of DeLand can be provided the best quality of life for themselves and their family. Jessica is a graduate of Florida Agricultural and Mechanical University where she earned her bachelor of science degree in broadcast journalism and minor in education. Jessica is a High School Teacher for Volusia County Schools where she teaches a career preparation and learning strategies elective course for freshmen students. Member of The DeLand Alumnae Chapter of Delta Sigma Theta Sorority Inc.
Jessica Davis is from the neighboring city of Daytona Beach. She married her best friend Mario Davis who is a DeLand native and they have a daughter named Marissa. Jessica enjoys spending quality time with her family, mentoring youth, participating in community engagement events, traveling, word search puzzles and reading. Kevin Reid was elected to Seat 5 on the DeLand City Commission on November 6, 2018. Kevin is a native Floridian, grew up with the love of the outdoors and service to his community. Kevin relocated to DeLand after high school to attend college. He fell in love with its small-town charm and could not imagine a better place than DeLand to raise a family. 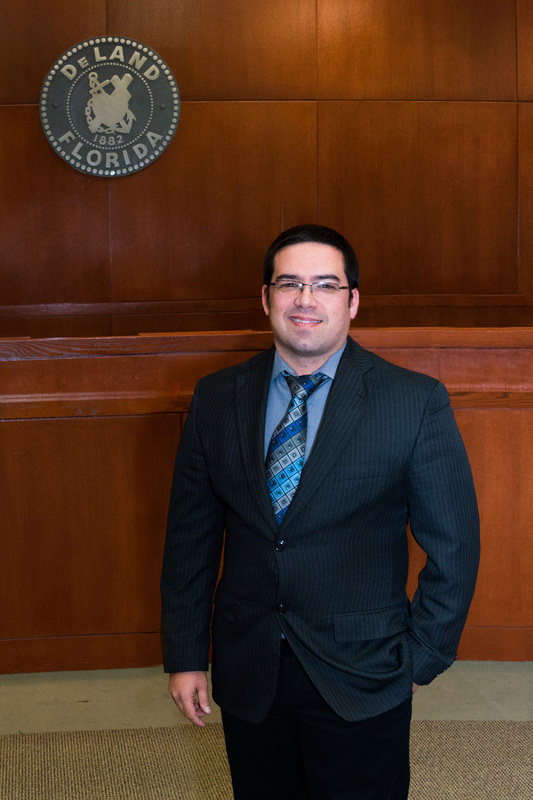 Kevin is an Associate at Dreggors, Rigsby and Teal, P.A, a local DeLand, CPA and Investment Advisor Firm.